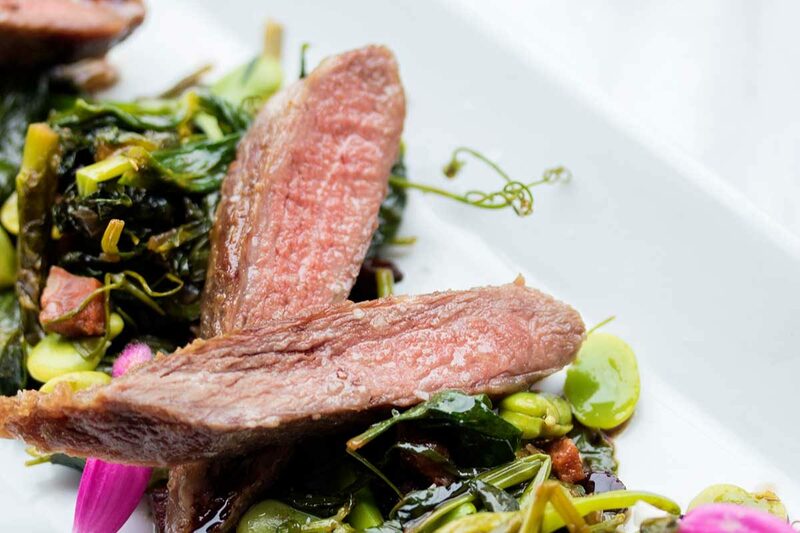 Succulent, rich Iberico pork secretos (a flank-steak-like cut from behind the shoulder) are paired here with creamy fresh fava beans & vegetal pea vines spiced with chorizo. This dish is a real treat, but isn’t difficult. Give it a try! Stir the chorizo pieces and red onion in a dry frying pan or skillet over Medium heat to render out the fat. Cook, stirring frequently until the chorizo crisps. Deglaze the chorizo pan with the vermouth. Add the pea vines & currants. Continue to cook, stirring, until the pea vines wilt. Add the fava beans and tarragon to the pan. Taste & add salt as necessary along with the sherry vinegar. Remove the pan from the heat. Sear the secretos in a different hot, oiled pan over high heat to your preferred doneness. 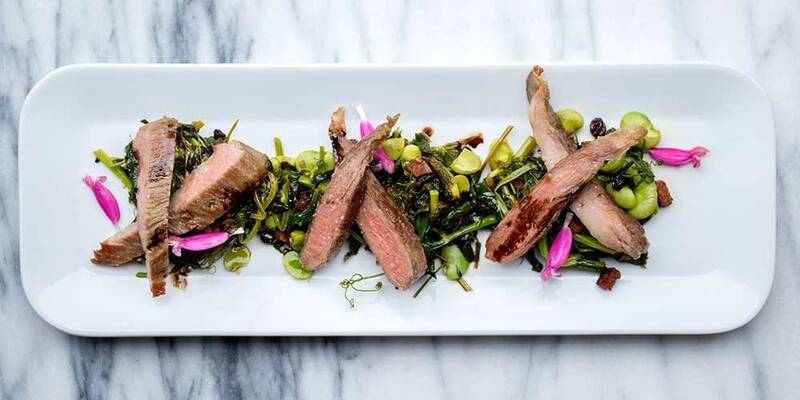 We recommend Medium Rare (125-130°F), which is how the Spanish eat Iberico, but it’s worth noting that the USDA recommends all pork be cooked to an internal temperature of 145°F. Remove the secretos from the heat to a clean plate & let them rest, loosely covered, for ten minutes before slicing. Slice the secretos & serve them atop the fava & pea shoot mixture, drizzled with a little balsamic vinegar.